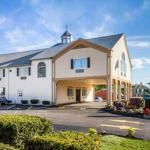 Free Wi-Fi free breakfast and an impressively low price make for a comfy stay at the Quality Inn & Suites South Portland which is close to I-295. This two-story hotel offers 68 rooms with hairdryers and cable TV. Some rooms also have refrigerators microwaves coffeemakers and irons with ironing boards. Fuel up for the day ahead with free continental breakfast and lots of fresh java and get in a quick workout at the on-site fitness facility. Parking with space for trucks and RVs is free. The hotel is a mile off of I-295 and two miles from I-95. Spend a day hunting for bargains and take in a movie at the state's largest shopping venue the Maine Mall three miles away or head down to the beach and fun rides at the Scarborough Beach six miles south. Downtown Portland with its historic waterfront the University of Southern Maine and lots of great lobster spots is six miles north. Portland International Jetport is four miles from the hotel.